Once again, my dad offered to drive me to Hanako Japanese Restaurant to help me save a considerable amount of travel time. After ending up in the wrong city last time, it was time for us to use one of the basic necessities of the 21st century - Google Maps. Fearing that the restaurant would be full at prime lunch time, we set out early and arrived at the restaurant shortly after 11:30 a.m. We entered the restaurant in high spirits as we had made zero wrong turns on the way there. In addition, the restaurant was only a quarter full and the sky was beautifully overcast. Hanako Japanese Restaurant is an authentic Japanese restaurant located just a block away from Guildford Town Centre. It has been in operation for a long time and the interior of the restaurant somewhat reflects this, although everything was very clean and tidy. In addition to the regular menu, there is a specials menu that consists of some very luxurious items such as the prestigious Blue Fin Otoro at $10/piece. I hadn't mentally prepared myself to destroy my wallet, nor did I bring enough cash with me to add Otoro to the items I planned to order, so I handed the specials menu back to one of the waitresses and ordered wallet-friendly things such as the Teriyaki & Tempura Lunch Box. 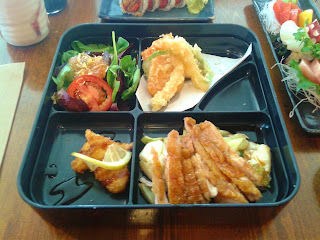 The first item of the Teriyaki & Tempura Lunch Box to arrive was the Miso Soup. My dad was the recipient of this Miso Soup as he only likes to eat hot/warm things (with the exception of sashimi). That was fine by me as my dad is a very picky eater and tends to give me helpful descriptions of the food he eats. The Miso Soup was garnished with fine pieces of seaweed, green onion and tofu. 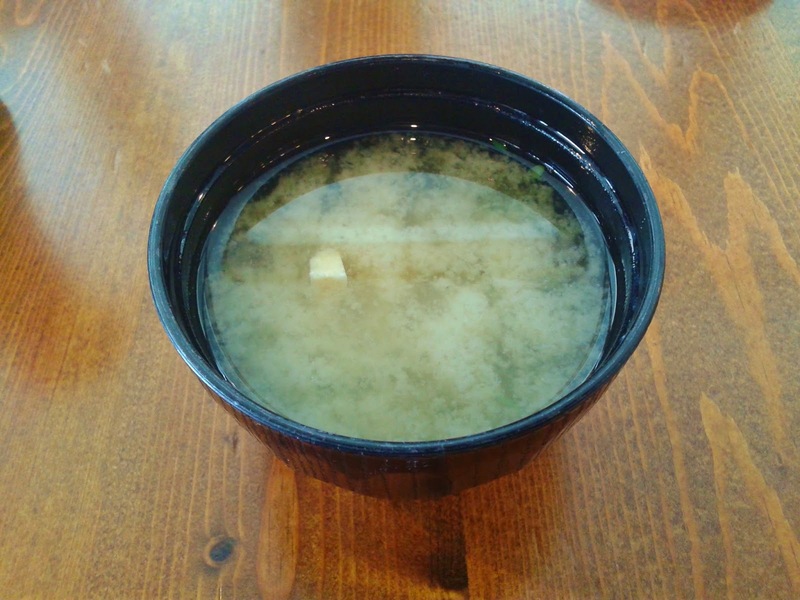 It was an above-average Miso Soup with a well-balanced taste. After a 20-minute wait, everything else that I ordered arrived almost simultaneously. I had to play a bit of table tetris in order to get everything into photographable positions. 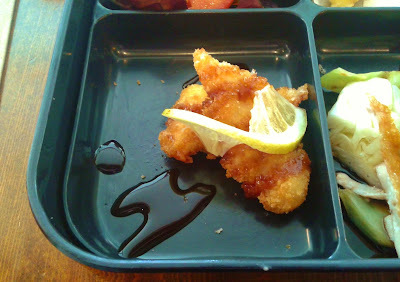 Pictured above is the remainder of the Teriyaki & Tempura Lunch Box. The Salad consisted of salad greens accompanied by a vinaigrette, some crispy bits, and a slice of tomato. The citrusy vinaigrette needed to be spread out better, but the bottom layer tasted decent with the additional flavour from the olive oil resting at the bottom. 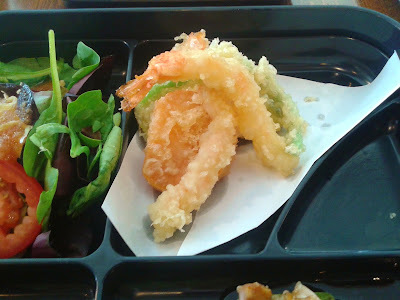 The Prawn Tempura (2 pcs) was a delight with a crispy, light layer of batter and a skinny piece of prawn that had a good snap. 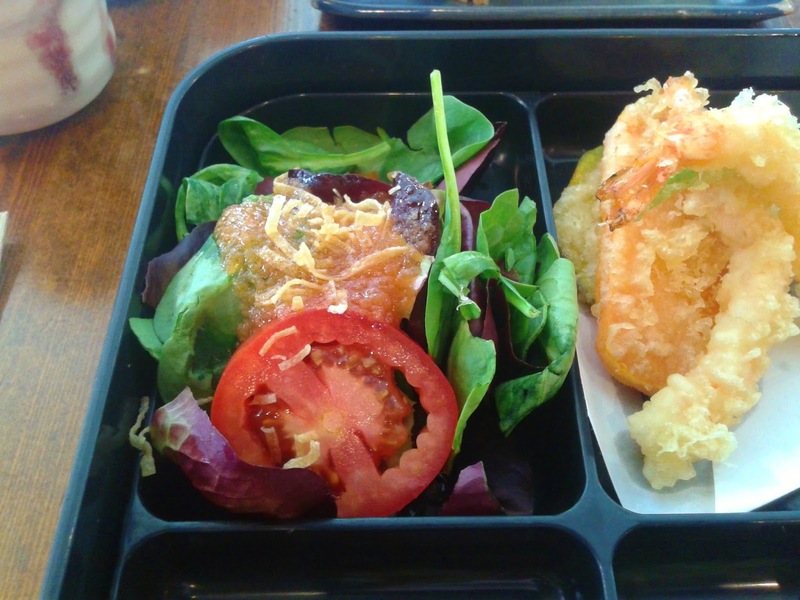 The Sweet Potato Tempura had a nice sweet flavour and was cut to the right thickness. The Kabocha Tempura needed a bit more sugar, while the Green Bean Tempura was sufficiently soft and juicy. The Day Special came with what I believe to be Breaded Cod (I was too focused on savouring the food and forgot to confirm with the servers). The cod was soft and the batter was crispy without being hard. The tangy sauce and the slice of lemon livened up the flavour of the Breaded Cod. The Chicken Teriyaki came with some large cabbage leaves underneath. The chicken was simply but carefully executed. 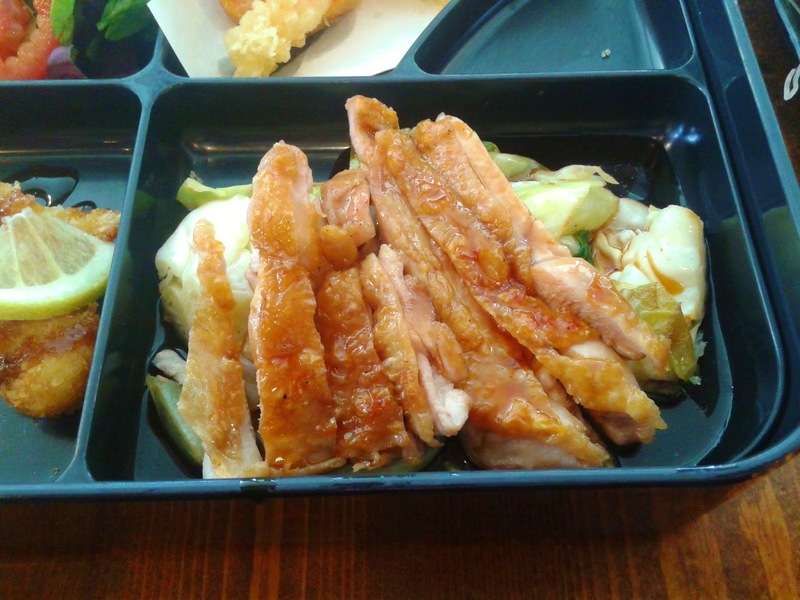 I enjoyed the tender chicken and the slightly crispy skin and my dad enjoyed the high-quality rice that accompanied the Chicken Teriyaki. Don't worry, I actually gave my dad most of the chicken to go along with the rice. 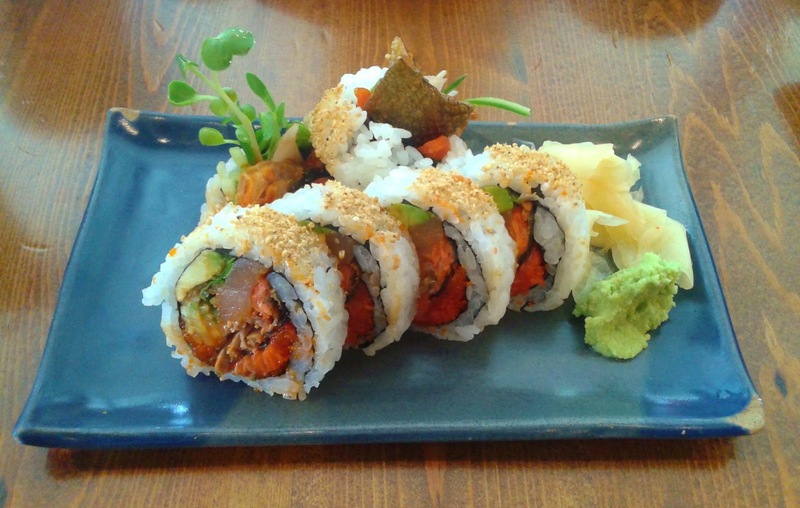 The Hanako Roll consisted of sockeye salmon, grilled salmon skin, masago, cucumber, avocado, spicy tuna, and a few pieces of daikon. Since the Hanako Roll is not a hot/warm thing, I gladly gobbled up the whole roll. I thoroughly enjoyed the colourful burst of flavours the roll provided, and I was impressed by the fact that I could actually taste all of the different ingredients used in the roll. The Assorted Sashimi was actually the first to land on our table but the last to land in my mouth because I had to move it aside in order to take photos of the other dishes. I guess I inadvertently saved the best for last because the sashimi was not only generous but also surprisingly fresh. The Tuna Sashimi melted deliciously in my mouth while the Ma Tai Sashimi (genuine sea bream) was silky smooth with a delicate sweet flavour. (I think Madai is the correct spelling but the waitress seemed really sure about the "Ma Tai" spelling on the menu. Who am I to disagree with a Japanese person on Japanese?) One of the pieces of the Ma Tai Sashimi was soft (which I luckily managed to get). The Tako Sashimi was cut a little too thick but had a fresh-from-the-sea taste, while the Sockeye Salmon was the best of all with a rich flavour and a smooth sheen. The service was quite friendly and I was quick to notice that the waitresses served the dishes with graceful, elegant gestures. It was almost like watching a ballerina with food. The restaurant did get quite busy, but was never 100% full during my visit. 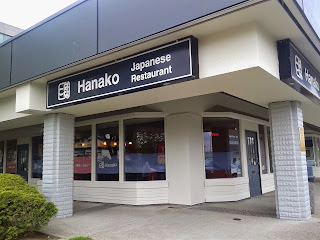 In any case, I can confidently say that Hanako is one of the best Japanese restaurants in Surrey. 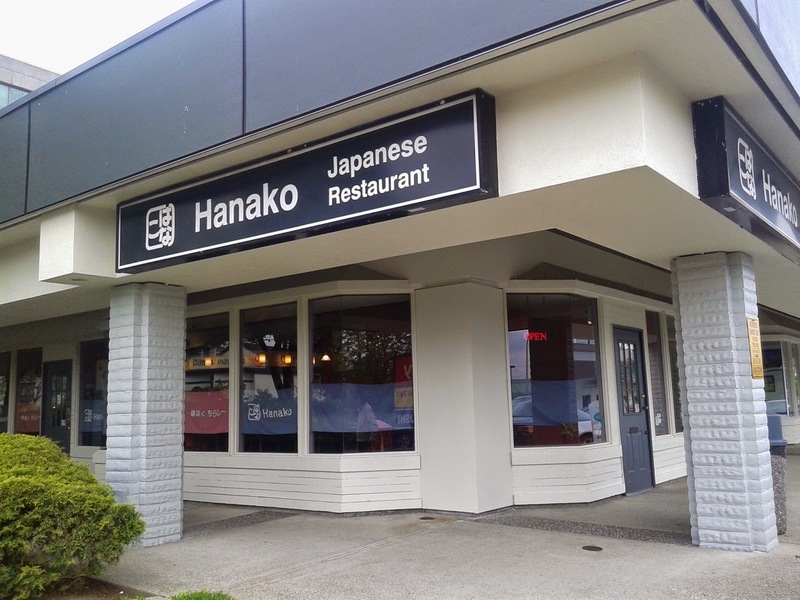 In fact, my dad liked it so much that he now insists on taking my mom out to Hanako.